The global medical device cleaning market is projected to receive a strong push in demand on the back of the soaring focus on sterilization and disinfection in the healthcare industry. This could also be one of the reasons for the towering growth of the disinfection cleaning process. The increase in healthcare expenditure is forecasted to be another important factor propelling the growth of the overall market. Vendors operating in the market could be pampered by auspicious prospects birthing with the surging incidence of hospital-acquired infections (HAIs). The global medical device cleaning market is envisioned to earn a valuation of US$1.7 bn by the completion of 2022 from a US$1.3 bn reached in 2017. During the forecast timeframe 2017–2022, the market could progress at a 4.4% CAGR. As per the expert analysis presented in the publication, the world medical device cleaning market is prognosticated to be segregated into four segments according to process type, i.e. pre-cleaning, manual cleaning, automatic cleaning, and disinfection cleaning. Although there could be opportunities in each of these markets, the disinfection cleaning market for medical device cleaning is anticipated to be placed first in view of revenue share. By the end of the forecast period, this market by type of product could bag a 39.9% share. On the basis of instrument type, the market could be segmented into surgical instruments, endoscopes, and ultrasound probes. All of these crucial segments of the world medical device cleaning market are meticulously and comprehensively assessed in the publication in order to provide a full evaluation of the significant opportunities in the industry. This could help players to place a confident foot forward every time during their journey in the market. According to the analysts, the international medical device cleaning market is prophesied to be classified into six vital geographies, viz. the Middle East and Africa (MEA), North America, Asia Pacific except Japan (APEJ), Latin America, and Europe and Japan. Each of these geographical segments are deeply studied in the publication with a view to offer an all-inclusive evaluation of the performance of the market in different regions of the world. Between 2017 and 2022, North America could cement a leading position in the international medical device cleaning market while expanding at a CAGR of 4.6%. Europe is envisaged to lose 47 basis points (BPS) in its market share during the course of the forecast period. Contrastingly, APEJ could gain 29 BPS. However, Europe could tread upon the heels of North America considering its 29.4% share in the market in 2017. Japan and the MEA are predicted to experience a slack in their revenue growth by 2022 end. Some of the popular names in the worldwide medical device cleaning market could be 3M Company, Cantel Medical Corporation, Ecolab, Inc., Getinge Group, Integra Lifesciences Holdings Corporation, Johnson & Johnson, Steris PLC, ORO Clean Chemie AG, and Ruhof Corporation. 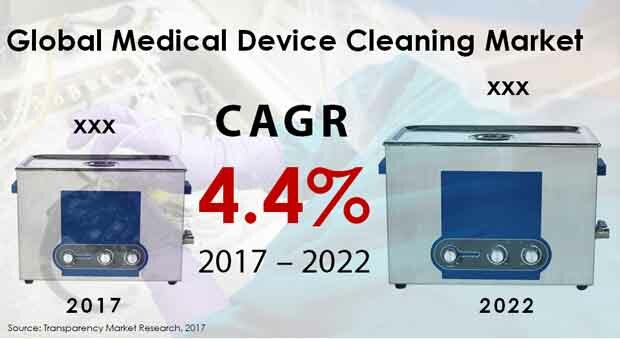 The international market for medical cleaning device is forecasted to obtain a boost in its demand owing to the growing emphasis on disinfection and sterilization in the industry of healthcare. This, however, is forecasted to be one of the main underlying reasons for such rapid growth of disinfection cleaning device. There has been an increase in the expenditure related to healthcare and the same is forecasted to be another significant factor that is attributed with the overall growth of the said market. Increasing occurrences of hospital-acquired infections or HAIs as it is conveniently called are further instigating the market players to make more investments in the market for medical cleaning devices. Taking vendor landscape into consideration, the market for medical cleaning device can be regarded as reasonably fragmented and the market players emphasize on strategically important acquisitions, mergers, collaborations and partnerships. The world market for medical cleaning device is visualized to experience dominance of the process of disinfection cleaning owing to the increasing efficacy of high quality disinfectants. Apart from that, there is a soaring demand for gadgets that are sensitive to heat together with first class sterilization and both are collectively fuelling the market for medical cleaning devices. Due to the increasing number of surgeries that are conducted, there is a rising demand for surgical instruments. The demand for surgical instruments is also fuelled by growing prevalence of chronic illness, expanding base of geriatric population. Increase in demand for surgical instruments is forecasted to drive the market for medical cleaning device. The market for medical cleaning device has been divided as per the type of instrument and by process. Taking the segment of process into consideration, the said market could further be classified into disinfection cleaning, manual cleaning, pre-cleaning, and automatic cleaning. Amongst all of these categories, the segment of disinfection cleaning is prophesized to account for a very large share of the market, registering its growth at 4.1% CAGR over the timeframe of forecast. Considering the segregation of instrument, the said market is there to make an offer of opportunities in different categories, namely, ultrasound probes, endoscopes, and surgical instruments. This market intelligence report provides a complete study of segmentations pertaining to the said market so as to assist readers in obtaining a clear and concise understanding of many different categories and their associated growth. As per the market analysts of the report, the world medical cleaning device market is forecasted to be divided into six major geographical areas, namely Japan, Asia Pacific except Japan (APEJ), the Middle East and Africa (MEA), Latin America, and North America. Each and every regional classification has been thoroughly studied in this research publication with an aim to make an offering of a comprehensive, well-informed assessment of the market performance in various different geographies across the globe..
Over the forecast timeframe, the market in North America is expected to secure a prominent position in the world market for medical cleaning device while registering its expansion at a 4.6% CAGR. It is expected that the region of Asia Pacific excluding Japan could gain momentum during the forecast period that extends form 2017 to 2025. It is further estimated that the geographies of Middle East and Africa and Japan could witness sluggish growth towards the end of the forecast period. The analysts of this report have profiled some of the topnotch companies that are active in this market. Companies such as Johnson & Johnson, Getinge Group, 3M Company, Integra Lifesciences Holdings Corporation, Cantel Medical Corporation, Ruhof Corporation, Ecolab, Inc., ORO Clean Chemie AG, and Steris PLC are a few of the eminent names that adorn the said market. These leading companies are expected to focus on strengthening their presence across various geographical through various growth promoting strategies like product diversification, acquisitions, partnerships and collaborations.